Open-plan living has taken the world by storm, no less so in Marbella and its neighbouring towns of Estepona and Benahavis, but while it is very much the contemporary way we see ourselves living out our daily lives, this is not a brand new home layout. In fact, open-flowing interior architecture with a minimum of walls and a clear departure from the boxy, ‘walled-in’ homes of old, is one of the most ingrained principles of what is loosely called ‘modern architecture’. And, as we know, modern architecture is also not a new thing. In its earliest recognisable form it can be traced back to the turn of the 20th century, when new engineering technologies made it possible to radically rethink the home for the first time in centuries. Freed of earlier limitations, a house or edifice could now literally ‘soar’ into the heavens, with high-rise structures opening up a world of new possibilities. Even so, the first experiments in modern architecture and open-plan interiors were seen in private villas and public projects, where the multitude of walled-in little rooms made way for larger, brick-free spaces that invited occupants to breathe and move around. This sense of wellbeing was enhanced further with larger windows, more natural light, warming rays of sunshine and also views out to the garden and beyond. And so was born the modern home that evolved throughout the 20th century and which has now become the 21st century norm. Clean, white walls, large window frontage and expansive floors covered in cooling or warming materials – depending on the effect desired – mark today’s villas, penthouses and apartments. It’s a world where living room, dining room and kitchen flow into one, with the erstwhile formal dining room and out-of-the-way kitchen victims of a desire to tear down walls and merge the home’s areas into one. As this is sometimes done literally, with a bare minimum of dividing walls, the main form of division now comes from stairs and the different levels they connect. They maintain the divisions of the home that still exist, often between the private suites on the upper floor(s), the living spaces on the main floor and the guest and entertainment or even spa zones at basement level. However, each of these areas is made up of a succession of interactive, semi-open spaces that flow the one into the other, skilfully designed to offer both privacy and connection. 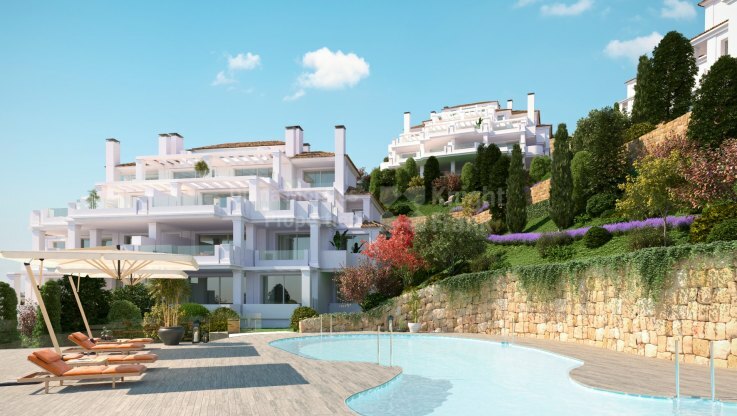 DM Properties/Knight Frank has a prime selection of open-plan apartments and houses for sale in Marbella, Benahavis and Estepona. We would be more than happy to help you find the one made for you.